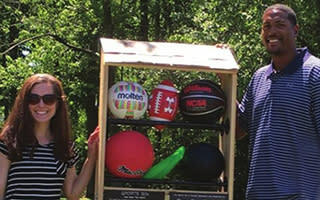 This summer, three Lansing-area public parks became testing grounds for Sports Bin, a new local program that encourages physical activity and team sports by providing free sports gear onsite.The idea is simple: each of three parks — Frances Park in Lansing’s Moores Park Neighborhood, Ferris Park in downtown Lansing and Valley Farms Park in downtown DeWitt — has a small wooden roost stocked with a supply of sporting equipment. Users are encouraged to borrow the basketballs, soccer balls, Frisbees or volleyballs, and return them when they’re done kicking, hurling or smashing them around. The program planners got the idea earlier this year when researching two free reading programs: Dolly Parton’s Imagination Library, which provides free books to preschool-age children, and Little Free Library, which has grown from a few dozen boxes in the Midwest four years ago into over 50,000 spots in all 50 states and 70 countries today. Sports Bins are most similar to Little Free Libraries in that they’re physical locations made of wood that have an inherent “give one, take one” ethos. “There’s a social responsibility component built in for sure, and I’ve been pleasantly surprised by the amount of use the bins have been getting and how little loss there’s actually been,” said program organizer Kalea Sanford. “We were restocking the Valley Farms bin, and we ran into a couple of guys playing basketball. They said they had forgotten their own basketball and saw the one in the bin so they were able to play. Their exact quote: ‘You are awesome.’” Sanford built a budget in for replacing lost and worn-out equipment up to three times in a season, or about every four to six weeks during the warm weather season; this year’s extended heat wave has kept the Sports Bins busy through mid-fall. Each ball is inscribed with the “Sports Bin” moniker and its home park, making it obvious where it belongs. Sanford, an MSU grad with a degree in kinesiology and health promotion, first contacted Lansing Parks and Recreation director Brett Kaschinske with her idea, with whom she had a previous working relationship. Once he was on board, Sanford went after another local sports world contact: Mike Price, co-founder of the Greater Lansing Sports Authority, a group that’s working to build Lansing into a sports tourism destination. Finally, she reached out to Andre Hutson, a member of the 2000 MSU men’s basketball championship team who went on to play nine seasons in the NBA before opening Conquest Health and Fitness Foundation in DeWitt. Then it was just a matter of getting her husband, Waylon Sanford, to build the actual bins, and voila: play for no pay. Mike Price is proud to have been involved with the budding, all-play, local sports program. "The GLSA was happy to step in and help with finding additional sponsors and make some connections with equipment donations," said Price. "Part of the GLSA mission is to continue to strive to make the Greater Lansing community fit and sports-minded and to see that the under-served have easy access to opportunities for the benefits one gains from athletics. This program is a perfect chance to live our mission." Building on this year’s success, Sanford said more Lansing-area parks will get Sports Bins next year, but those spots have yet to be determined. She also plans to start expanding the services to include groups that will organize teams at each location to use all of the equipment. This year’s pilot program is set to run through next month, after which the bins will take a break until spring when the new elements will be added. The program is just one more small example of how the Greater Lansing is always looking to level the playing field and get people off the sidelines and into the game. *Credit to the Lansing City Pulse Magazine for research and original article.